Happy "day after" Thanksgiving friends! How are you all feeling? After three (yes count em, THREE) Thanksgivings, my husband and I almost had to roll ourselves home and into bed. I WAS SO STUFFED. Have to say though, maybe the BEST tasting Thanksgiving we had yet! MmMmm! And our fridge is stuffed (hooray!) with leftovers! MY favorite! Ok ok, so let's talk Samantha! Samantha is an amazing blog friend of mine, and the creator of Elah Tree, the blog and shop. Not only is she fun and super quirky (which I love! ), but she is also a fellow Christian blogger. 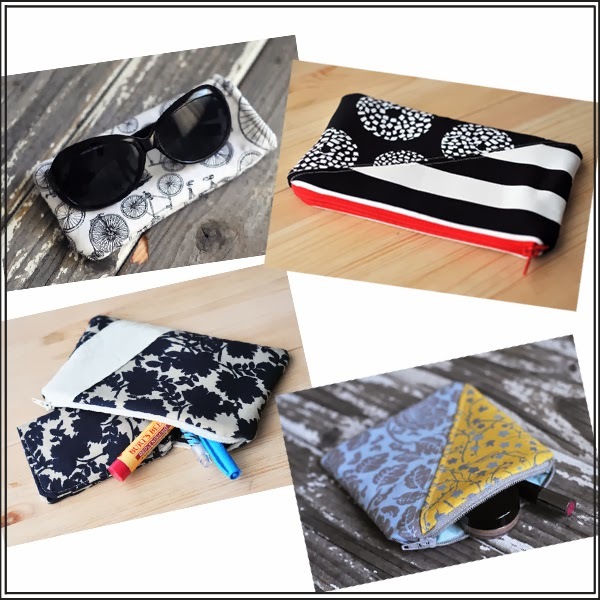 Her blog is full of encouraging and fun posts about faith and what have you, and her shop is loaded with some of the cutest handmade pouches, wallets, and sunglass cases! She pays such awesome attention to detail in her work and really chooses styles and fabrics that are timeless and classic, yet juxtaposed together in a way that makes them contemporary. I think there are about 50 items I'd love to buy! I'm just so excited to showcase her this month! Let's get to know Samantha a little better, shall we? Well, hello! I'm Samantha the girl behind Elah Tree, a lovely little blog and shop dedicated to infusing creativity into everyday life. I'm married to the coolest guy around (Tyler) and we spend our every days in good ol' Southern California. There are two things that I really really like... a lot. Those two things are creativity and encouragement and it's within my blog and shop that I get to do that. I love encouraging others to pursue their own creative journey and I love breathing life into all my creative designs. 2. 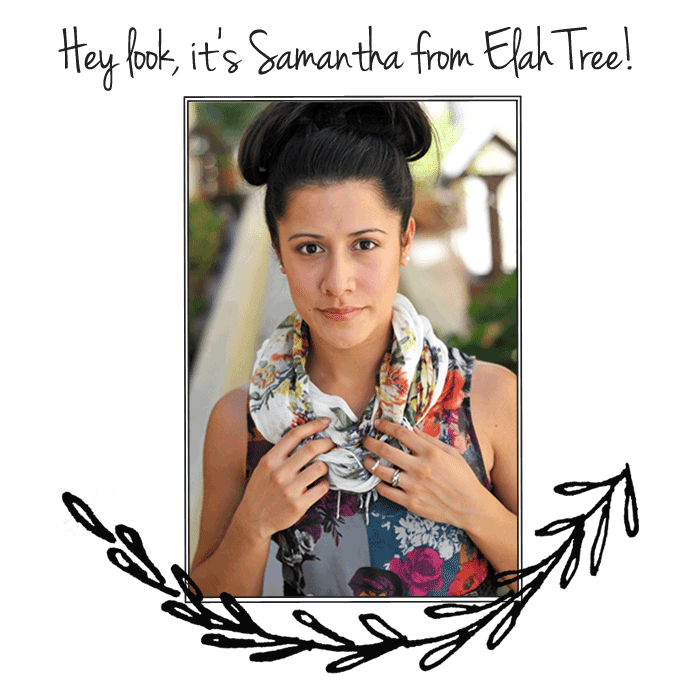 What encouraged you to start Elah Tree, the shop? So many different things led up to the opening of my shop. I have always had a desire to create and creating with my hands led to sewing. I've learned that being immersed with lots of different creatives will definitely inspire and encourage you to want to start your own creative journey. My husband always had big dreams and I have been blessed to be a part of his and watch them unfold. With his encouragement and a passion to create Elah Tree, the shop was born. 3. Where do you find inspirations for your items and designs? Over time artistic style and design evolve. I've recently been able to hone in on really defining the Elah Tree designs. I'm often inspired by nature and art. Nature has a really sweet sense about it. It can be rough and rustic, but also feminine and sweet. I love simplistic yet dynamic design, which I think can often be seen in different art pieces. As of lately I've been inspired by fashion. Not necessarily everyday fashion or runway fashion, but more in the area of movie costumes, which is really new and exciting to me. Tyler and I are really big movie people and I love the idea of taking the style, texture, design and feel of a movie or show and turning into an accessory. Something to look for in future designs. 4. How do you balance your blog, shop, and home life? This has been tricky to figure out and sometimes it feels as though it changes as I learn what works best for me. I'm very blessed because my blog and my shop are my full time job. I shape my work hours around Tyler's work hours. So when he's not working neither am I. I love being able to work on blog, shop, and home stuff while Tyler is at work. Then when he comes home we have the evenings and weekends to spend together and I don't have to worry about house chores and such. I do love to outline my schedule on our computer which helps me manage my time and projects. Hopeful, encouraging, dynamic... those are the first three that came to mind so I went with it. 6. Any special news you can share for us about Elah Tree? I'm super excited to announce that on December 4th my very first Winter Collection will Debut! This is the first collection I have created and I've been pretty pumped about it! This is the honing in I mentioned above and I've really been able to shape and design the new products in the direction I would like Elah Tree to go. Now that we're really good friends with Samantha and know all about how awesome she is, let me make her even more amazing! One Sweet Lavender reader has the chance to win one of her Black + White Medium Zip Pouches! Isn't it a thing of beauty??? Jealous I can't enter! This pouch is a great everyday accessory! It will keep you organized and organized in style, at that. Fits easily into larger bags and can be used for a variety of different reasons, like storing make-up, camera accessories, cash, keys, chapstick, or whatever loose items get lost in your purse! 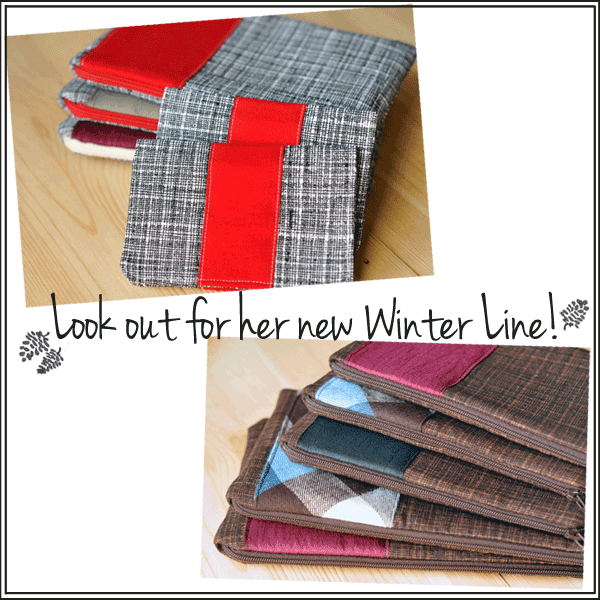 This pouch measures approximately 7"x4.5" and looks amazing in it's contrasting black and white fabrics and red zipper! Not only that, but Samantha has also offered ALL Sweet Lavender readers 20% off anything in her shop from now until December 13th! Just enter code: SWEETLAVENDER upon checking out. I mean.... Goodness! Perfect in time for Christmas! Now you can buy this, and this, and this! Also, make sure you bookmark her shop for December 4th, and get some of those gorgeous new Winter Line items for your friends and family! 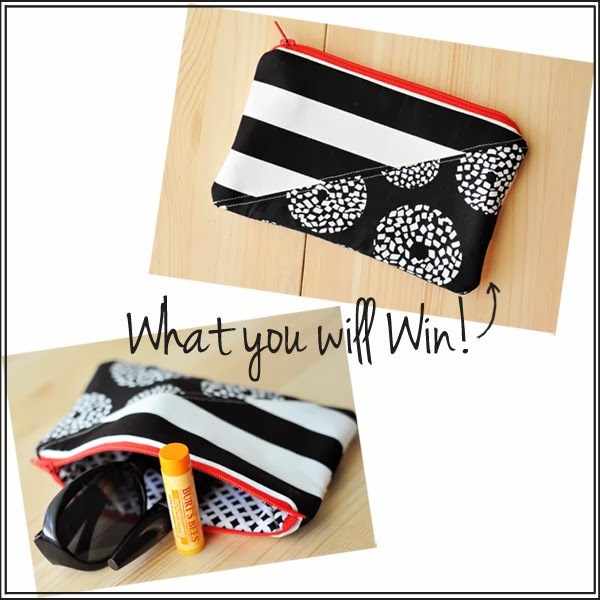 Enter to win her Black + White Zipper Pouch by filling out the rafflecopter form below. Sorry, only open to US residents. Contest will run for one week and winner will be contacted via email. Winner will have 24 hours to claim prize before a new winner is chosen, so make sure you check those inboxes. I love pouches of all sizes so this shop is perfect. Thanks for introducing us to Elah. Love the peaches square pouch, such pretty fabric! The Medium Zip Pouch: Purple Floral has been my favorite for a while because it uses a fabric from my wedding. I love the sunnies cases! I am so excited for her winter line!! I love the sunnies case.